My weaving teacher from the Workhouse Arts Center, Marilyn Harrington, gave me a floor loom more than a year ago. She had received it from a weaving teacher from a middle school when the weaving program ended at the school. She said it is not uncommon for people to give her old looms when their family members pass on. These looms are often in pieces and might even have missing pieces, making it challenging to get them functional again. Luckily in this case, she knew all the pieces were together. She said if I could fit all the pieces in my car, I could have it. Once again, my Honda Fit proved – you can fit anything into a Fit! I was amazed by her generosity and by how the stars aligned for me to actually own a floor loom. Perhaps she could tell after meeting me for only a few minutes that I would have the determination to get the loom working again. This loom is not a name brand loom, so we had no instructions on how to put it together. I truly don’t think I could have figured it out all by myself, but combining my limited experience on a floor loom with Bob’s logical brain, we succeeded. Mostly we looked to see where two pieces of wood had rubbed against each other to make marks, and matched up those marks. Then the loom sat in my living room for a year. 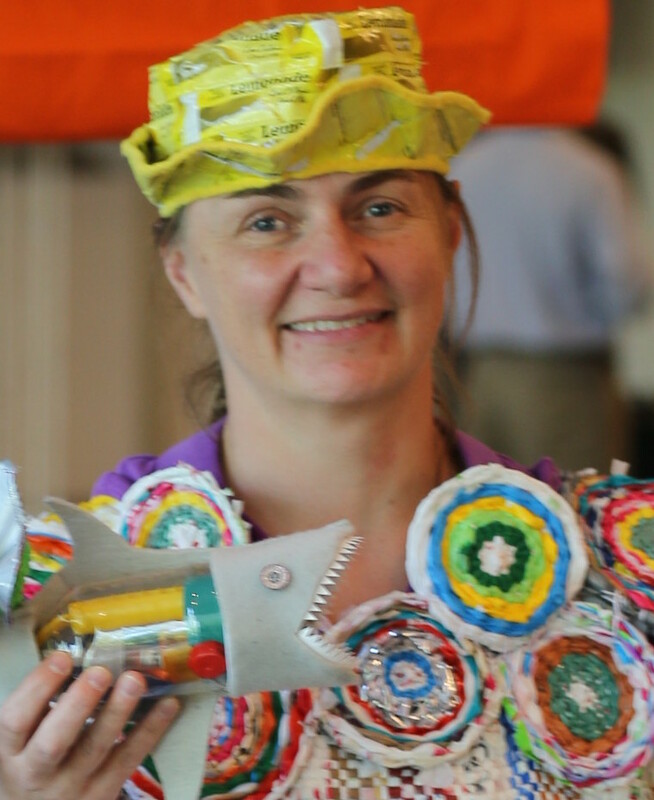 Life got busy as I started my innovation consulting business, Press the Go Button. I used Naval Jelly to clean the rust off the metal heddles and the reed. The heddles stayed shiny, but the reed looked rusty again within a few weeks. It took me months to choose which size of reed to purchase from the Woolery (a size 12 – 30 inches long). Once I ordered it, they had none in stock so it took another month to arrive. There was a warp on the back beam but it was no longer spaced out nicely and I was not sure whether to use it. I tried to lay it out carefully and counted the threads. Finally last week, I had time and I just started threading the heddles and the reed. 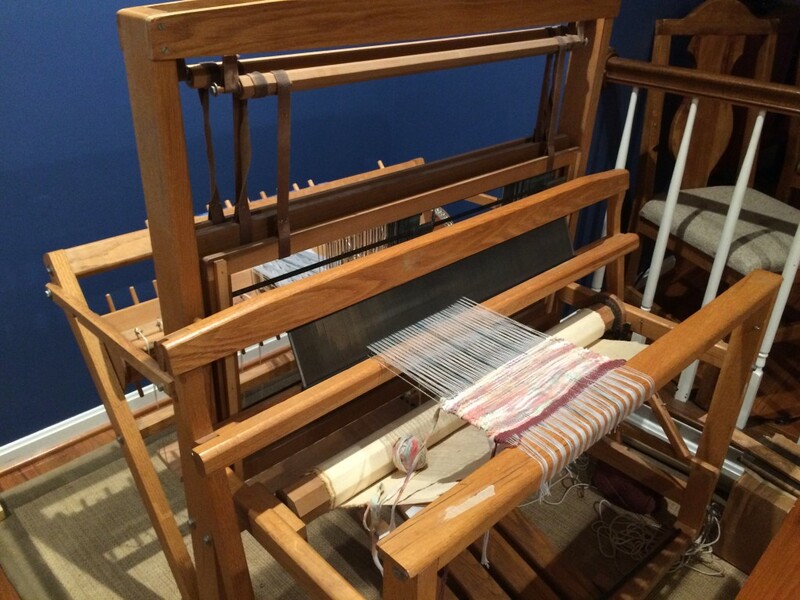 I referred constantly to the detailed blogs I had written while taking Marilyn’s class – how to thread a floor loom. Thank goodness I took all those photos! 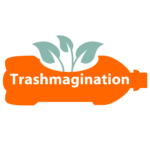 This has become one of the most popular blogs on Trashmagination, by the way, so others find it helpful too. The warp I used was tie dyed t-shirts cut into yarn. 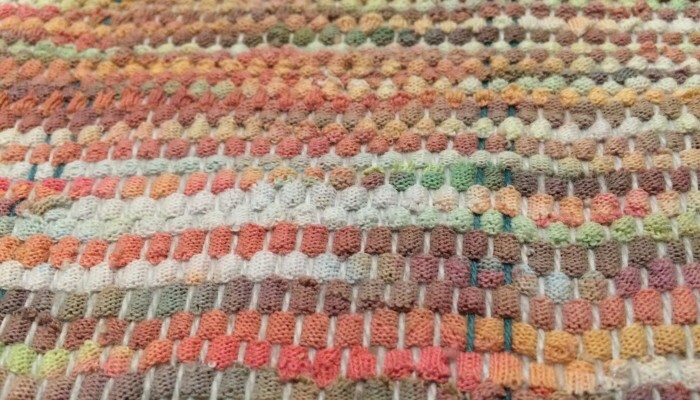 I love how it looks like variegated yarn and how it is thick enough that the weaving moves along. It gave me lots of opportunity to advance the warp and learn how my loom reacts. At that point, I gave myself a ton of work but learned a lot. I had threaded my loom off-center and the warp was all bunched up, so I tried to pull it out and re-thread it. The warp got all tangled up and it took me a whole night to untangle and straighten it out. Then I put it on wrong so it was tangled again. I lost 1/3 of the warp in the process. It was frustrating but unfortunately that is often how I learn best – by making mistakes and finding solutions with my hands, not my brain. I got the warp back into working order and did two more weavings. 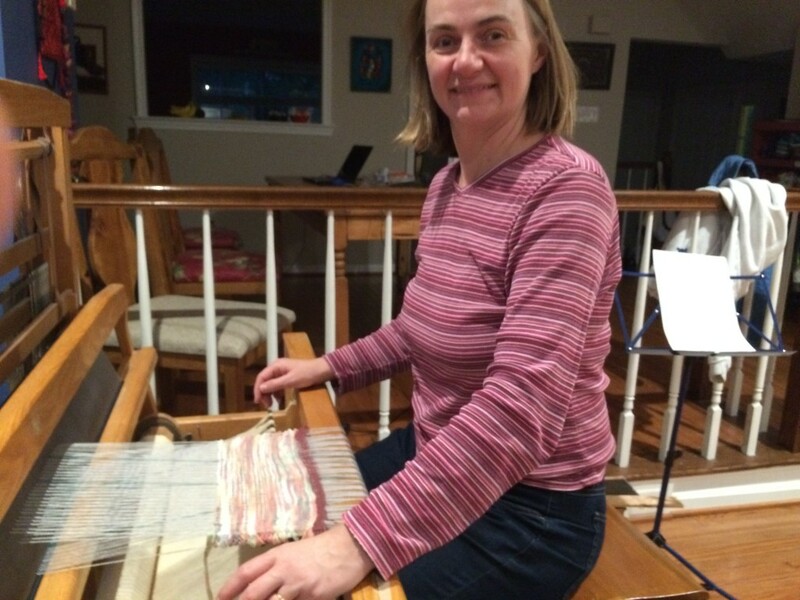 The first weaving was a pink and blue tie dye t-shirt. Weaving it made me think about gender topics and how people ask if your baby is going to be a girl or a boy. 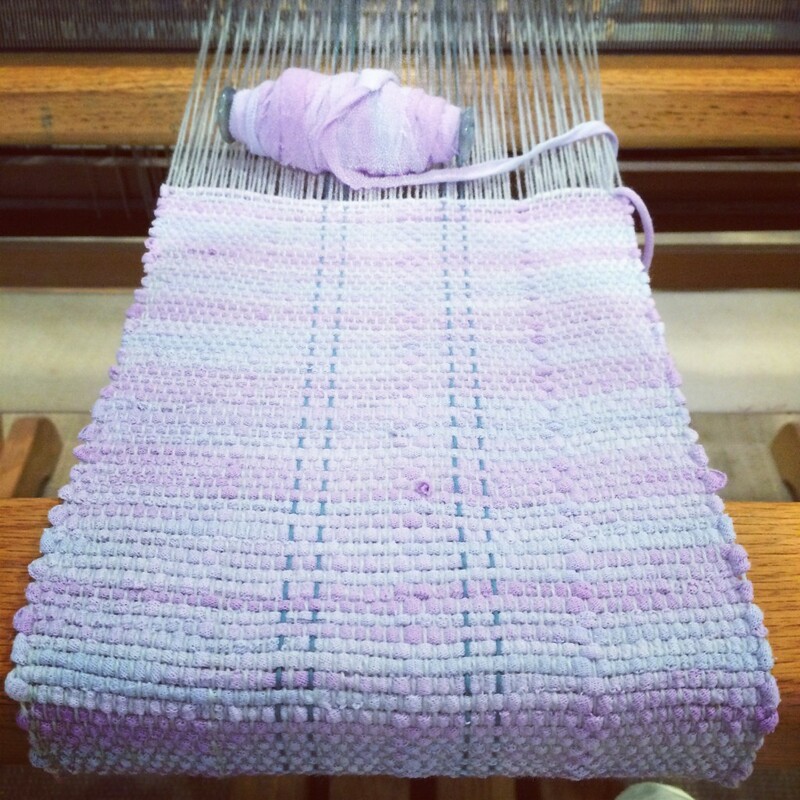 It’s a rather big topic to associate with a small simple weaving. I am thinking about sewing the words “Be Yourself” or “Be Who You Are” on that weaving. I was so happy to see the edges improving. The piece stayed about 7 inches wide the whole time. Next I cut up a light purple tie dye t-shirt. I found a new way to cut the sleeves and neck area so I got a lot more yarn out of one t-shirt. 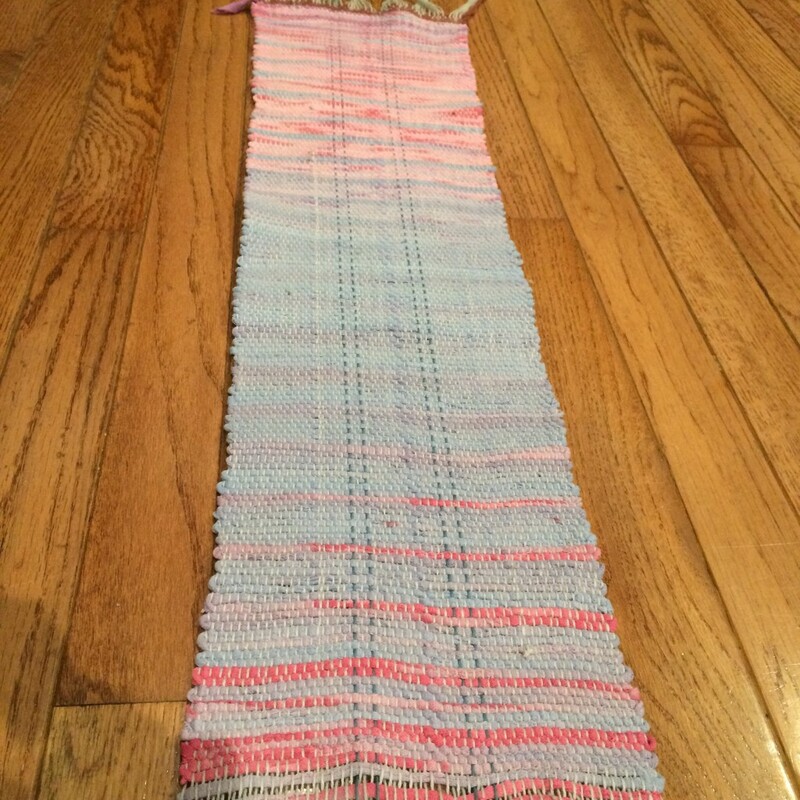 The original t-shirt was the same size as the blue and pink one, but the finished weaving is almost double the length. 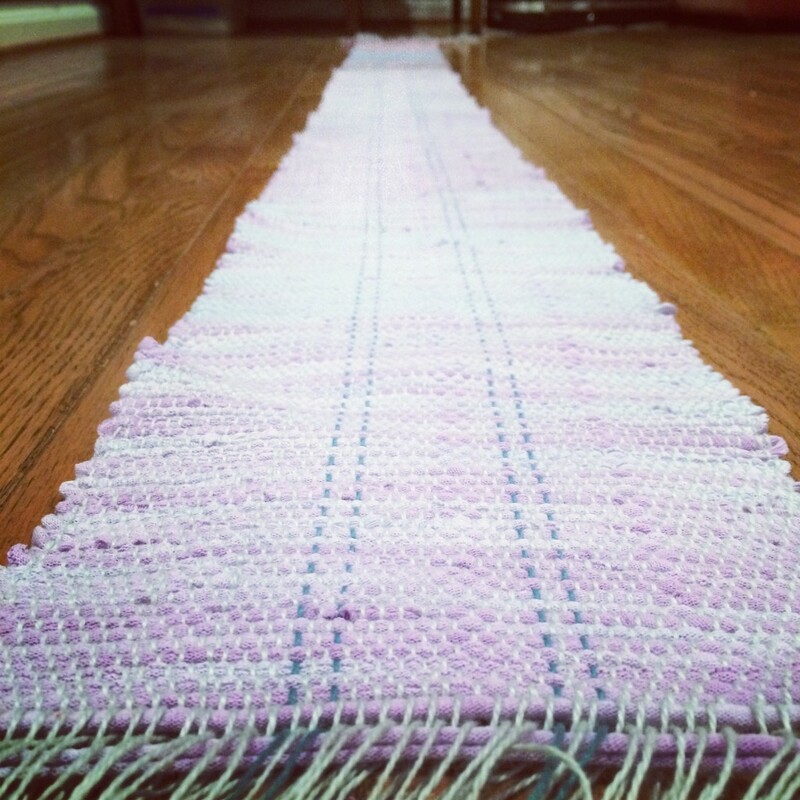 Again, this weaving stayed about 7 inches wide the whole time. I hope it is because I am getting better at edges, and not just that I can only do 7 inch wide weavings. When I make my next warp, I will make it wider to test that. I am so thrilled my loom works and all I bought was a new reed. I have a new shuttle as well that my mother-in-law gave me for Christmas. I learned that t-shirt yarn is rather bulky and fills the shuttle too quickly – so it will be more useful when I use thinner weft material. In the meantime, I just passed the t-shirt yarn back and forth in a small ball. It doesn’t make that satisfying shwoomp sound of a shuttle flying across a warp. But it was still a huge thrill. I think about all the students who have learned from this loom. The numbers 1-4 are still on the floor pedals and there are smears of orange paint from when it likely shared space in an art classroom. Good job, my dear. Thank you for coming into my life.